Scooby-Doo has the kind of longevity that scoffs at Gunsmoke or The Simpsons. He and Mystery Incorporated have been solving mysteries since 1969. They have outlasted eight U.S. presidents, four Tonight Show hosts and four Matthew Perry sitcoms. This makes it Scooby and the crew the perfect candidates for a Fan Favorite Friday. And, remember, you can borrow any and all of these movies from Mentor Public Library. 1. It all began with Scooby-Doo, Where Are You? The mysteries, the unmaskings, the Scooby snacks, the boneheaded idea to split into groups. Scooby-Doo is the great white shark of cartoons. It’s been perfect for so long that it’s barely had to evolve. 3. Speaking of Scrappy-Doo, if you happen to be a fan—we’re not judging—he was all over the 80’s The Richie Rich Scooby-Doo Show. 4. In the 1990’s, the Scooby crew traveled all around the world to collect dangerous ghosts at the behest of Vincent Van Ghoul (who was inspired and voiced by Vincent Price) in The 13 Ghosts of Scooby Doo. 5. Then the gang flashed back to junior high in A Pup Named Scooby-Doo. You could see Daphne, Velma, Fred and Shaggy as middle schoolers. 6. While Scooby’s never been gone, a series of popular direct-to-video movies led to a new TV show in the early aughts, What’s New, Scooby-Doo? The show had all the same charm as the original but long-time fans probably found it a little distracting to see Velma on a computer or Fred with a cell phone. 8. Not all iterations of the Scooby-Doo crew are equally popular. In Shaggy and Scooby Get a Clue, Shaggy inherits a mansion—haunted, naturally—from his rich uncle. 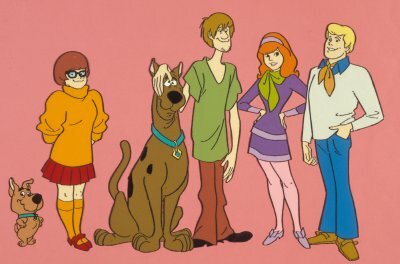 This series isn’t as well remembered as other Scooby shows, in part because it takes away the familiar conceit of solving mysteries with Velma, Daphne and Fred, but it’s a quirky entry into the Scooby canon. 9. Scooby-Doo is a master of the team-up. Over the years, he’s worked with everyone from the Harlem Globetrotters to Batman to John Cena. 10. The newest series starring Scooby-Doo, Mystery Incorporated, is the most ambitious. It features serialized storytelling, romantic subplots—yes, Fred and Daphne finally work it out—Lovecraftian monsters and a cameo by Harlan Ellison. Yes, that Harlan Ellison! Come back each week for a new Fan Favorite Friday. This entry was posted in Uncategorized and tagged Fan Favorite Friday, Mystery Incorporated, Scooby-Doo, Scrappy-Doo, Shaggy. Bookmark the permalink.